The battlefield seen from the Allied left, Bagration's column in the foreground. My bath-tubbed and abbreviated version of the Battle of Trebbia took place as planned yesterday, without an elephant in sight; (actually there is an elephant in one of the photos and a prize will go to the first person to spot it). 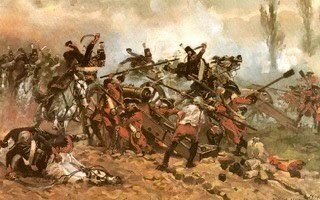 The orders of battle were detailed in the previous post, with the forces fielded on 1:3 basis, well roughly. This meant several small brigades became merged together in order to create a viable command, but it worked ok, with four brigades on each side. I don't like all the extra re-rolls and the like that one gets in BP, so have dropped them in favour of a few tweaks to the unit stats. 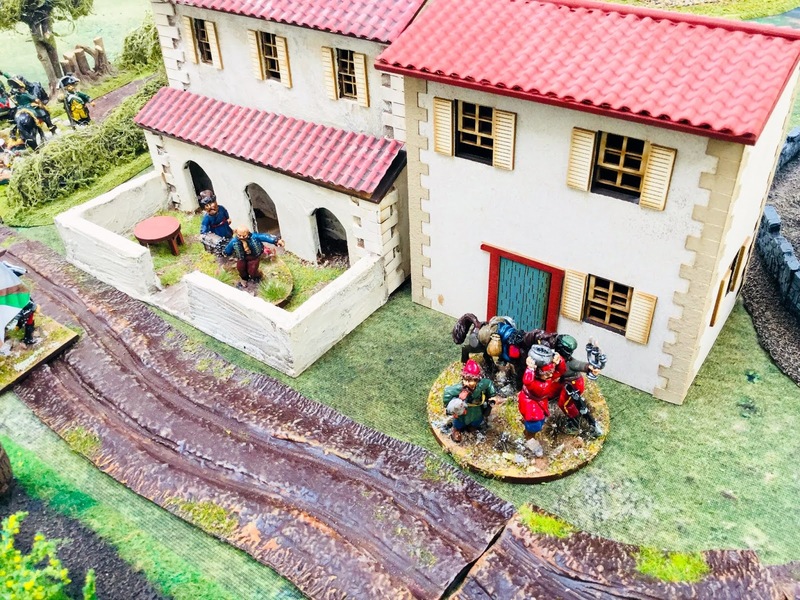 For example, the Russians are not 'stubborn' but have a stamina of 4, and what were 'crack' troops are given a better morale save. I've applied these factors in earlier FRW games when I last fielded the Russians in the Alps and it worked well, as it was to do in yesterday's game. I also am a big fan of a battery being represented by more than one model. I know cost is an issue to some players but I like the look of three of four models side by side, representing six or eight cannon, with limbers making an impressive footprint on the table. However, giving each model the same stats as a single gun makes the battery a killing machine, with combined stats for a three-model battery of 9/6/3. I've reduced this so each model in the 'battery' shoots with 2/1/1, as do single gun sections representing two cannon. 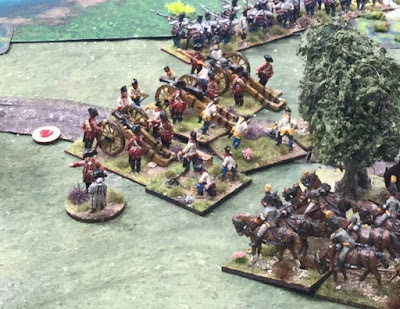 Guns 'in battery' and firing as such also get a single extra dice for the battery as a whole at medium and long ranges and two at close range. We threw for sides, highest getting the French, which resulted in Paul taking on the guise of General MacDonald, while I was adopted a split personality, being part Suvorov and part Melas, the latter acting as a mini CinC for his Austrian column commanded by Ott. The French centre deployed to attack. 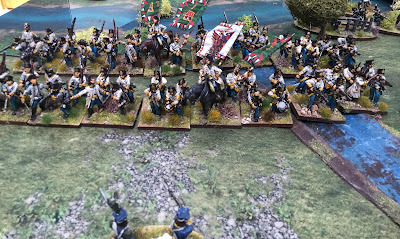 The French right hand brigade of General Watrin. 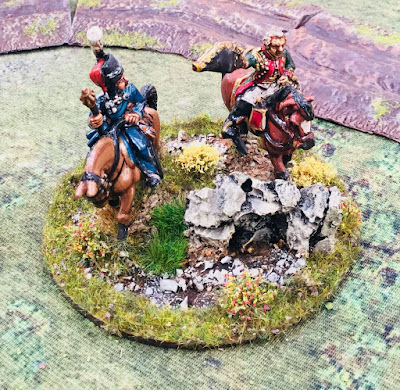 Marshal Suvorov and his trusty Cossack aide. 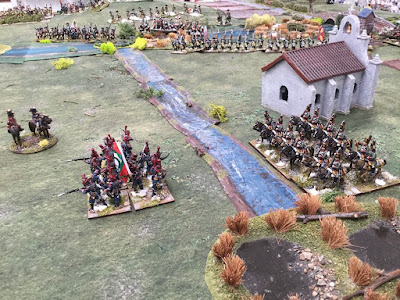 The Austrian column under Melas and Ott on the Allied right. The Russian central column, supported by Austrian artillery, dragoons and, off table, Austrian grenadiers. 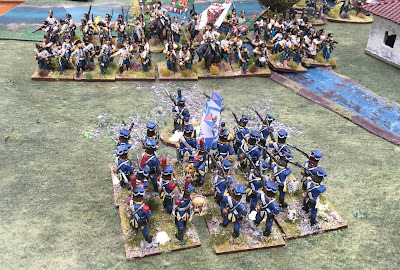 The French left under Victor. 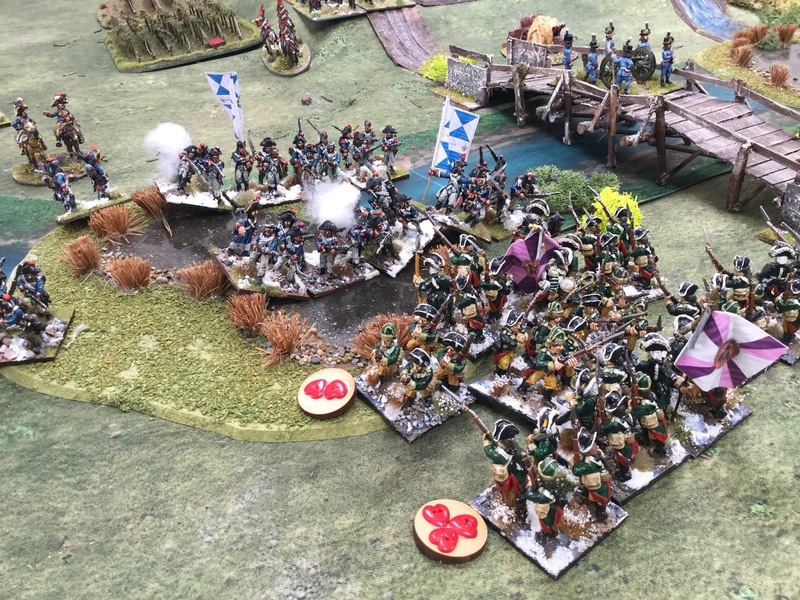 Paul decided to hold this veteran very strong brigade back and trust in his planned attack through the centre being successful. The French launched an all out attack in the centre and on their right. Infantry and heavy cavalry crossed the stream in the face of pretty ineffective Russian and Austrian fire. 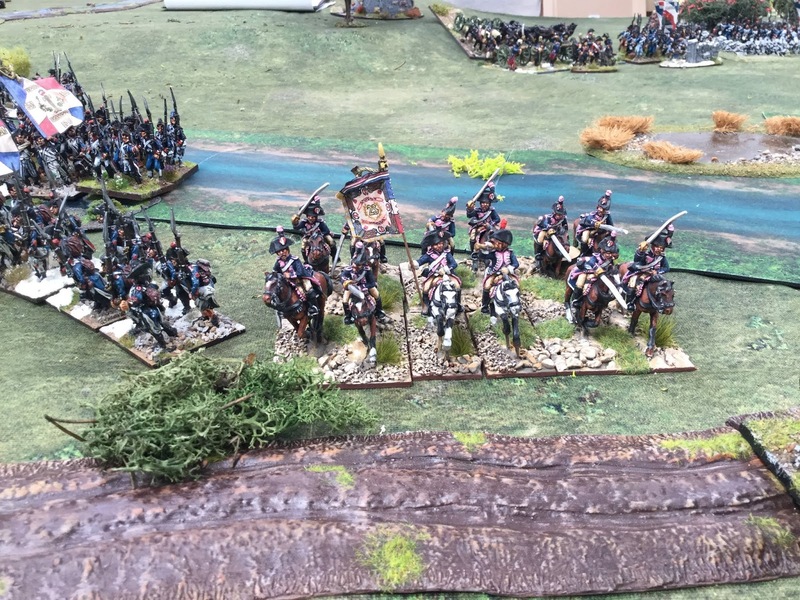 These cavalry were bundled unceremoniously back over the river by a regiment of Austrian dragoons. 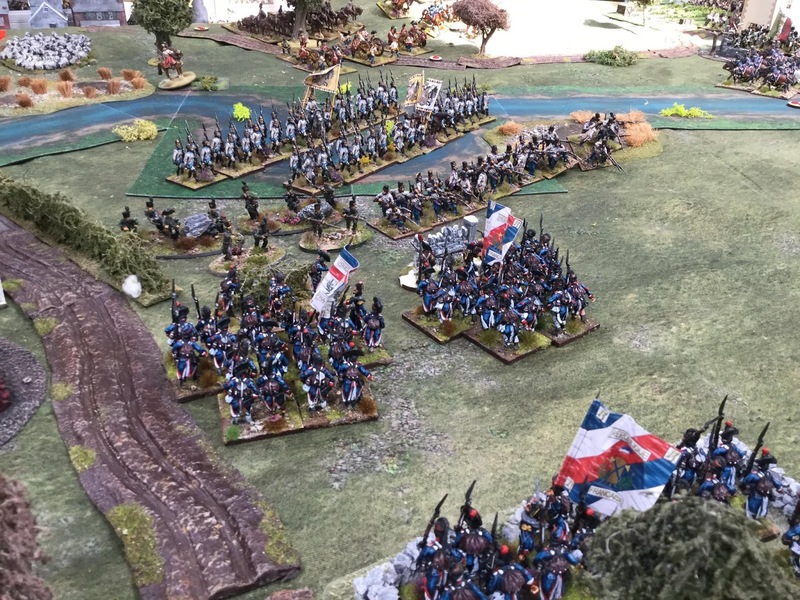 The French centre was led forward by their CinC who immediately fell victim to a stray bullet. I allowed the Paul to 'promote' Victor to the role. 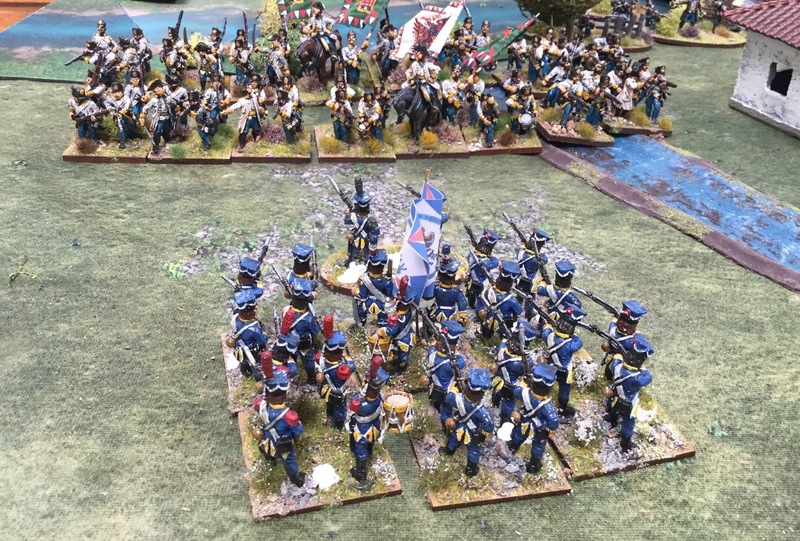 The Lombard Legion led the French attack in the centre. 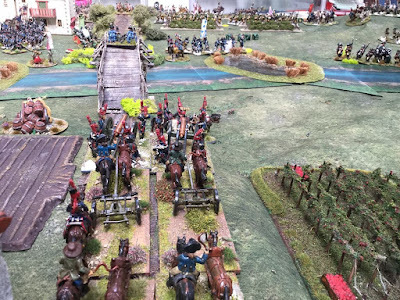 Lombard Legion artillery covered the attack from the bridge. 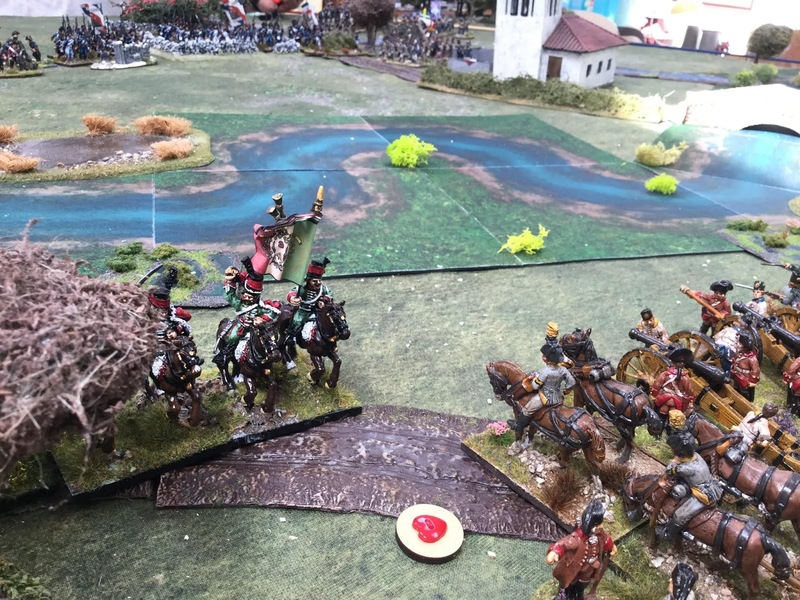 The Lombards were able to cross the river and engage in a firefight with the Russians, which they won. One Russian battalion had to take a break test after suffering excess musketry casualties from the Lombards and French who ganged up on them. I threw double 2 and broke. 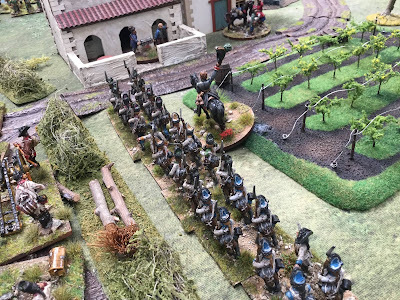 The surviving Russian battalion was positioned in the walled gardens and allotments and were to hold off several French and Lombard battalions for a number of turns. More French poured over the river in the centre. 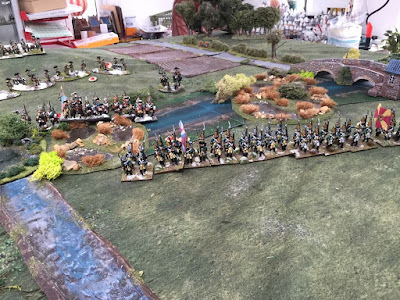 The Allied reserves had not yet arrived (I forgot them) and the nearest Russians were busily engaged with more Frenchmen crossing further down the river. 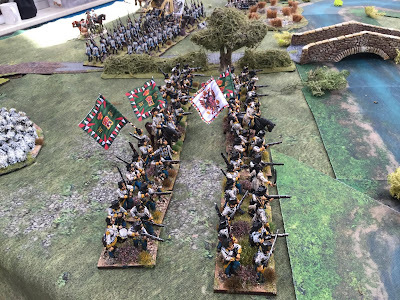 This heroic Russian battalion held the French commander's attention for a couple of turns and although forced to take two successive break tests, passed them both. 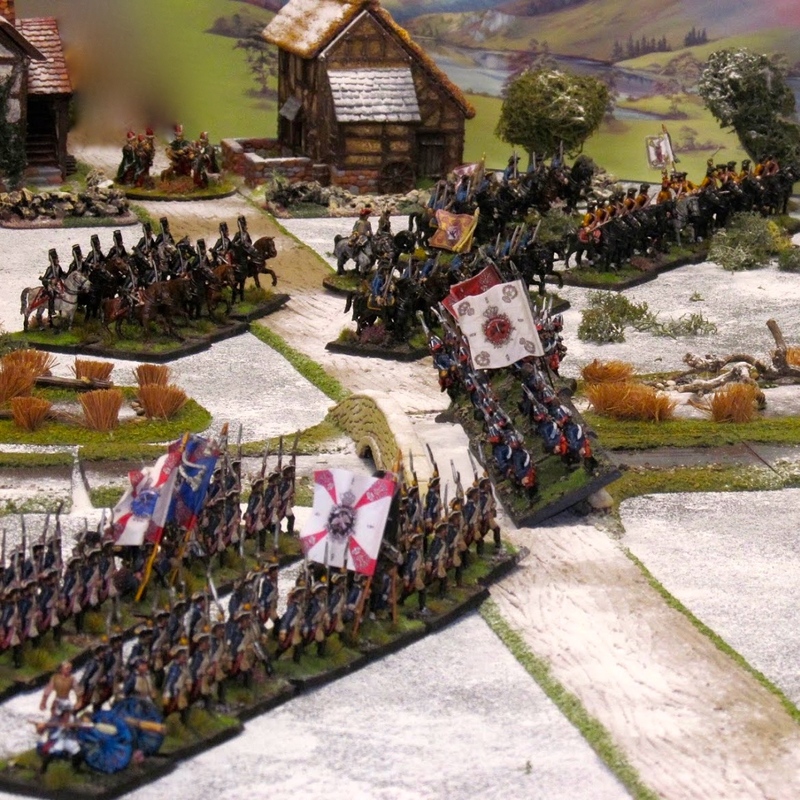 The Austrian dragoons then put in another appearance and charged the flank of the French assaulting the gardens. 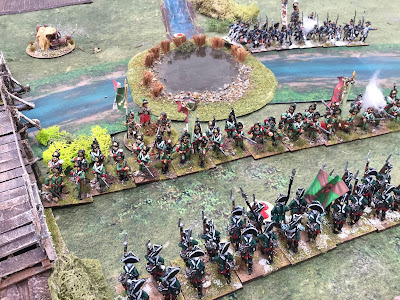 In a very complicated melee, the French ejected the Russians and broke into the gardens but their battalion hit by the dragoons was shattered and routed. 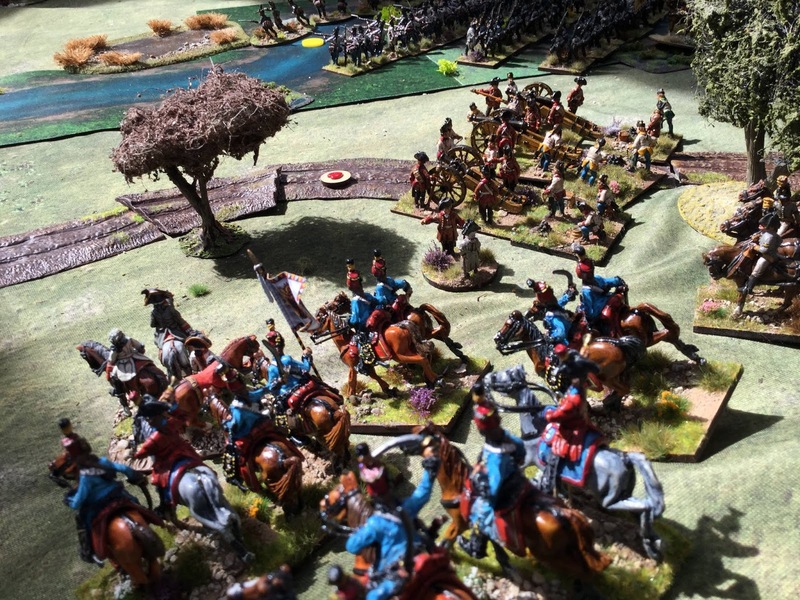 On the Russian left Paul sent two brigades across the river supported by cavalry and artillery. As was usual in this game, Russian fire was a waste of time and one defending battalion was forced to retreat. 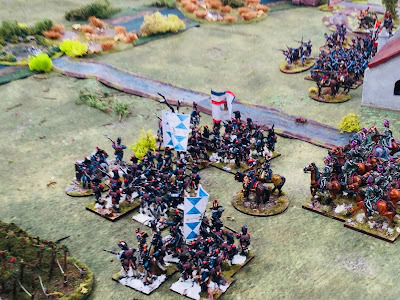 It was full on for the French as they pushed a regiment of chasseurs a cheval across the river facing the Russians, who yet again failed to cause any damage with their musketry. 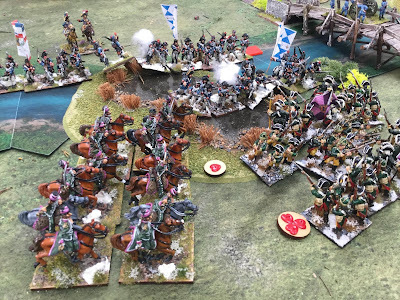 However, back on the other flank the Lombard Legion Hussars had been covering the flank of the French heavy cavalry, but found themselves in front of a battery of Austrian 12pdrs. 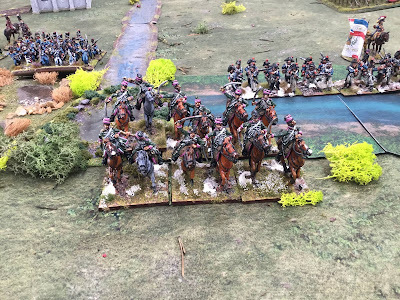 They took heavy casualties but remarkably Paul's break test was good enough for them to survive and merely retreat back across the river. 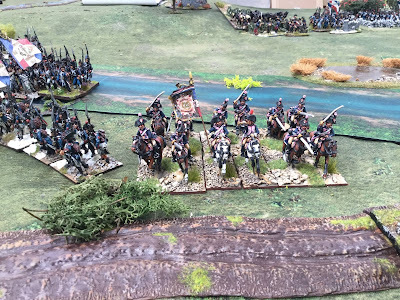 On the Allied left things were getting messy as I threw my Russian grenadiers at the approaching Frenchmen, having given up trying to shoot them. 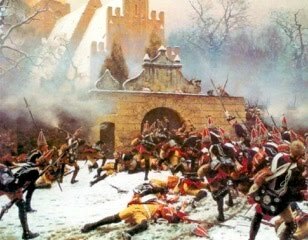 Suvorov was right, the bayonet is king. Pauls chasseurs charged my infantry, forcing them into square . 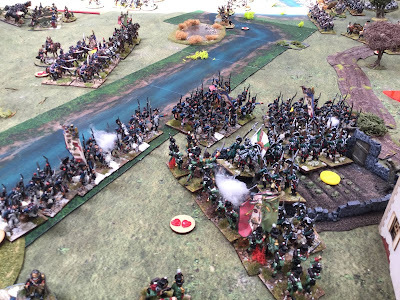 The chasseurs crossed the front of two Russian battalions during their charge and I failed to register a single hit! 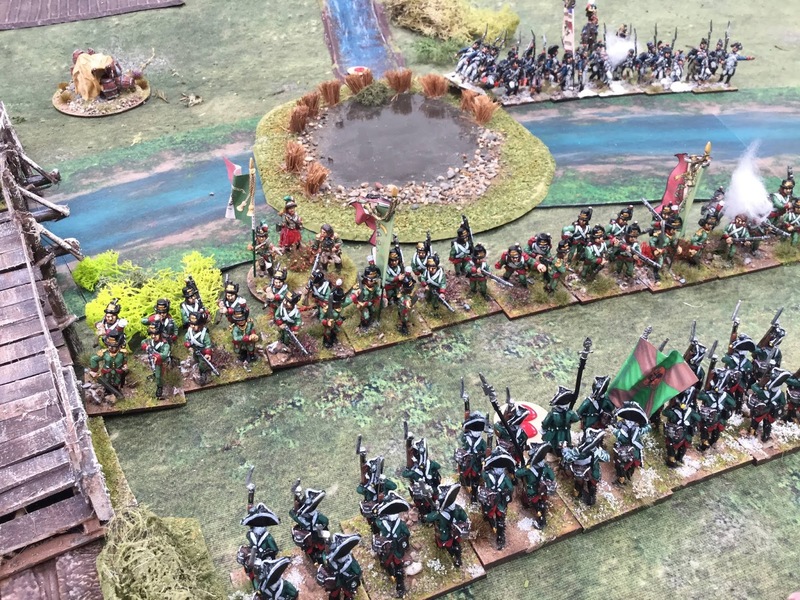 Thankfully, the next move made up for things and the chasseurs were forced to retire. 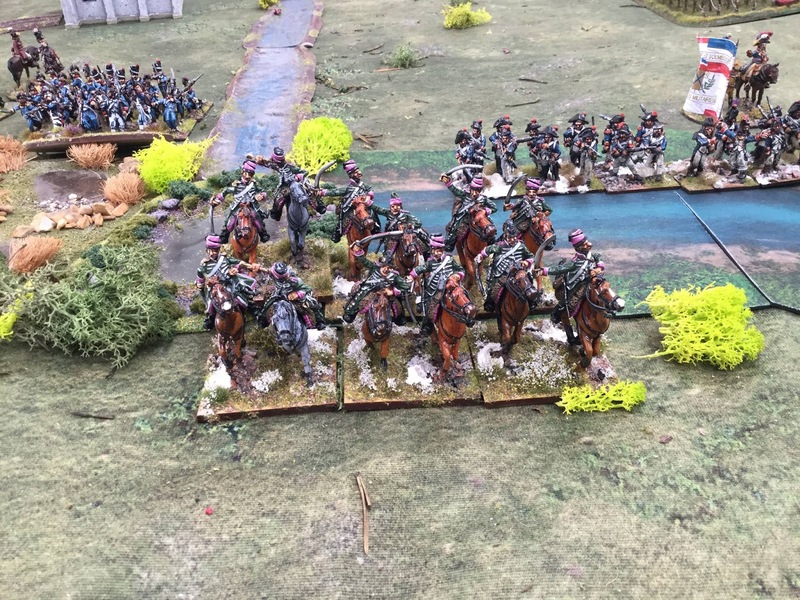 By now my central brigade was broken, although the Austrian grenadiers had finally made an appearance. Paul's right-hand brigade facing the bulk of the Russians was also broken and in retreat, and the other brigade (of Gen. Montrichard) was also teetering on the brink. Montrichard was last seen leading a battalion towards the Russians, sword in hand. He became a casualty as a result of excess hits in the melee, and a subsequent post game test decided he had been captured wounded. 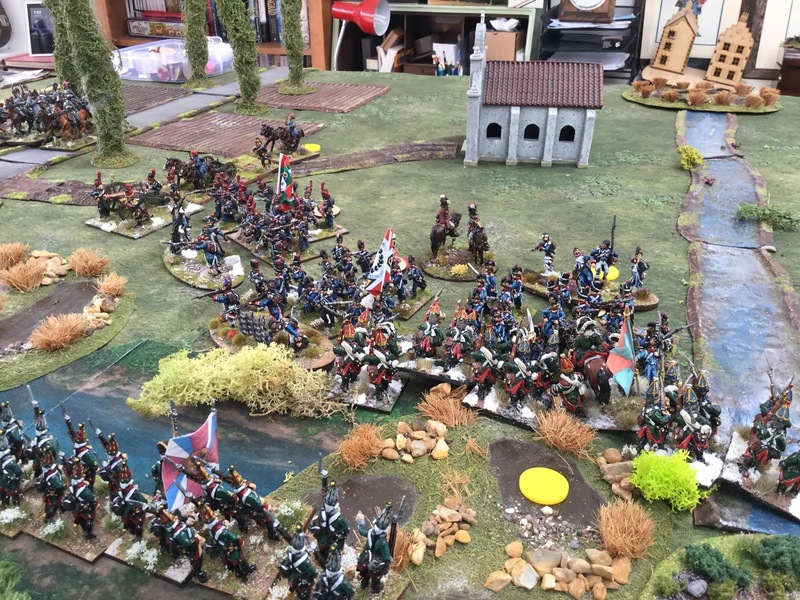 With the French in front of them in retreat the Russian left wing advanced. While over on the right, the Austrians had finally got themselves sorted out from their muddle and preceded by a battalion of Grenz were advancing en masse towards the enemy. At last the Austrian reserve grenadier brigade arrived, just in time to plug the large gap in the centre. 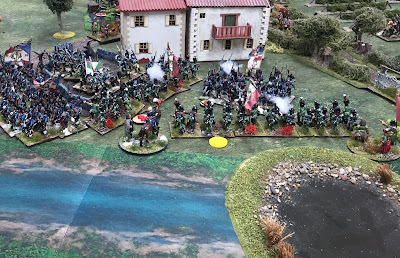 The artillery attached to the Austrian right-hand column did little to commend itself during the battle other than dispose of some Lombard hussars foolish enough to come into canister range. 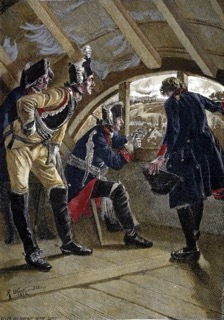 Nevertheless there presence was enough to influence the French decisions. 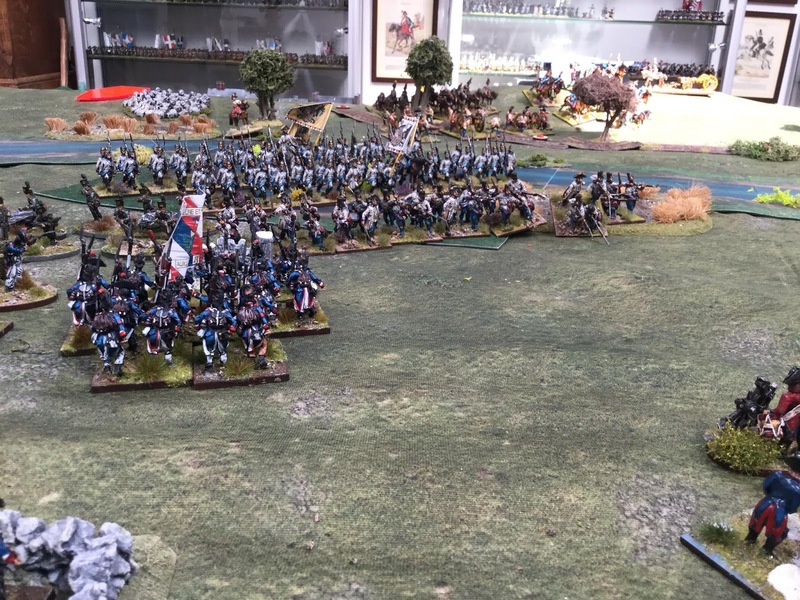 French horse artillery in the centre. They did sterling work knocking lumps off the Russians to either side of the bridge. The Lombard artillery were also effective in supporting their comrades and can be seen crossing the wooden bridge in the back ground. 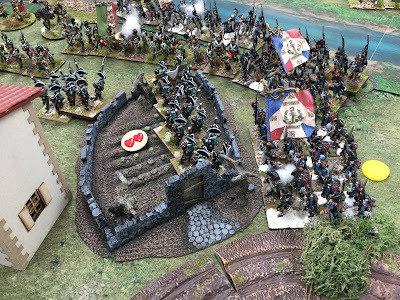 As the setting sun cast long shadows across the battlefield the Allies were secure in the knowledge that they had given the French a bloody nose. Austrians on the right flank crossing the river to attack the French. 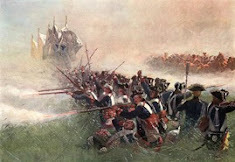 A Hungarian regiment engaged in an exchange of fire with the French occupying the seminary. 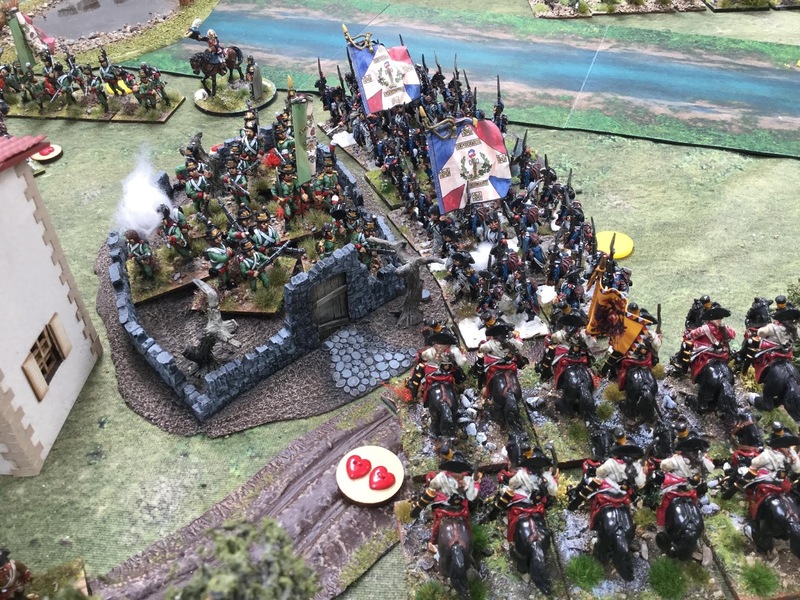 Over on the Allied left my cavalry had crossed the river, broken the French chasseurs a cheval, ridden over the section of horse artillery and forced the retreating demi-brigade legere into square. Not bad for an afternoon's work. 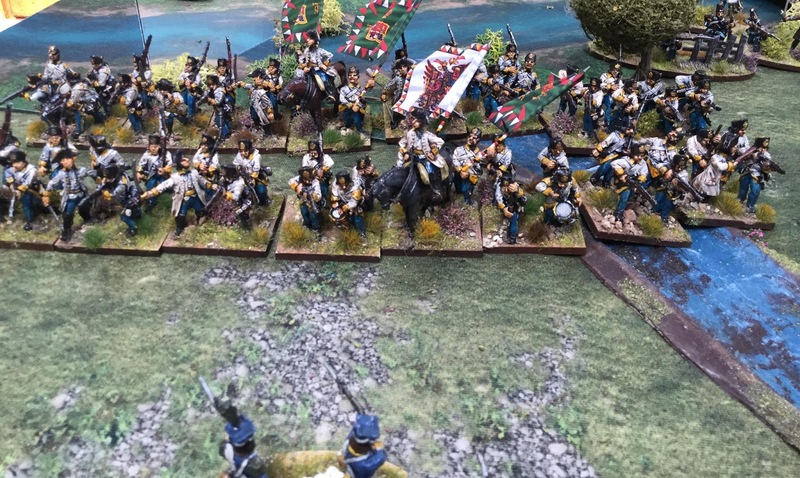 Back on my right the Hungarians finally decided to advance. 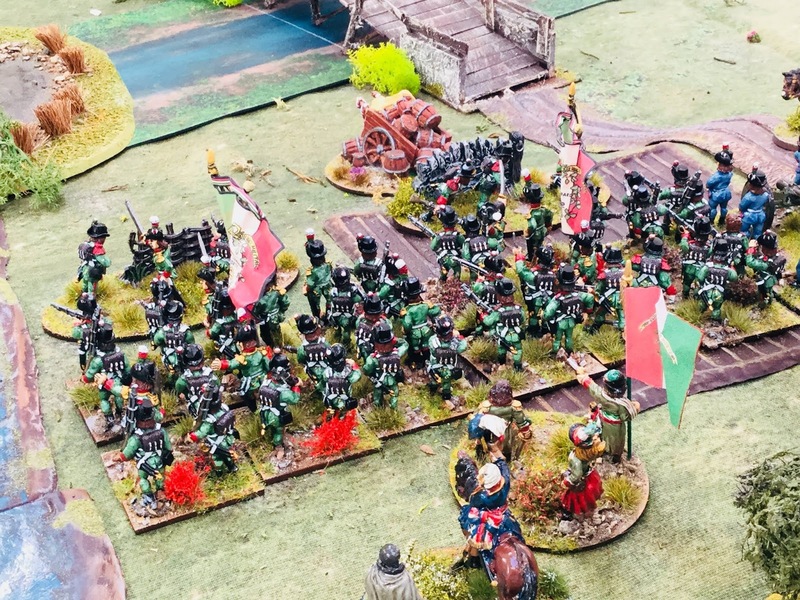 The Polish Legion look a little outnumbered and exposed. At this point we called it a day, as it was almost 4pm and we'd been playing since about 10:45. 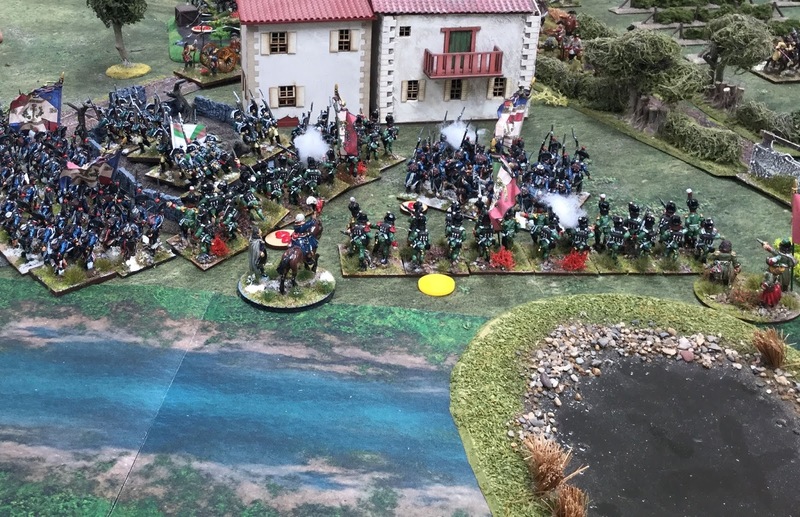 Two French brigades, both on their right flank, were broken. Their centre has broken through my centre but the Allies had no incentive to try and dislodge them. 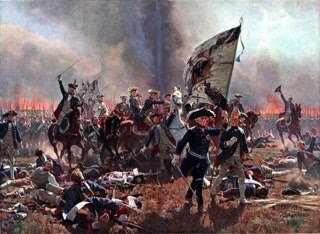 Had we continued the Austrians may well have prevailed against the veteran troops on the French left. 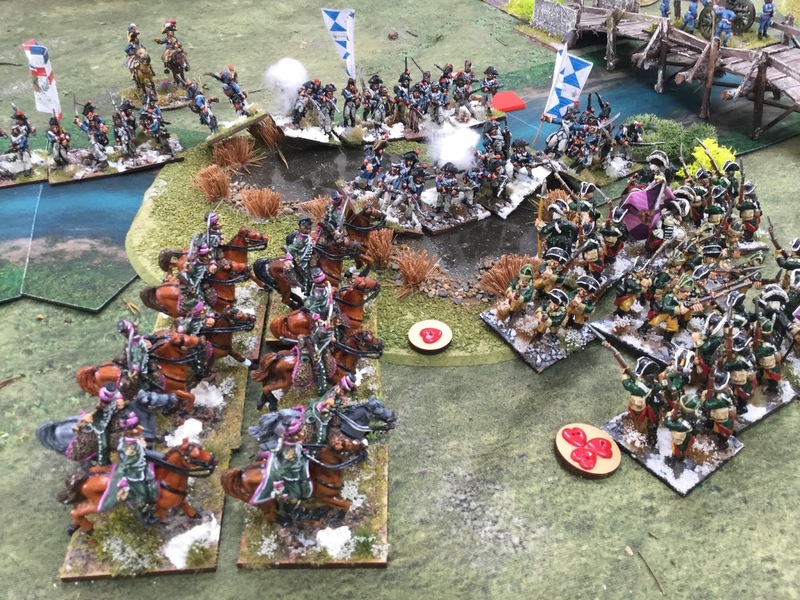 Who knows, but as it stood both armies had pretty much fought each other to a standstill and a minor Allied victory was declared. 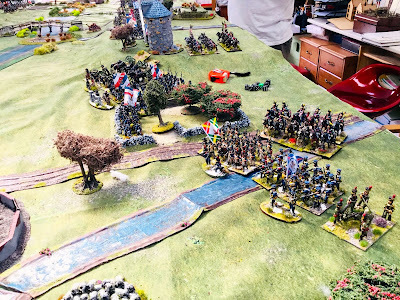 Of course, with the entire French right swept away and their centre easily isolated a more decisive Allied victory was undoubtedly on the cards. Humpff I hear Paul say. 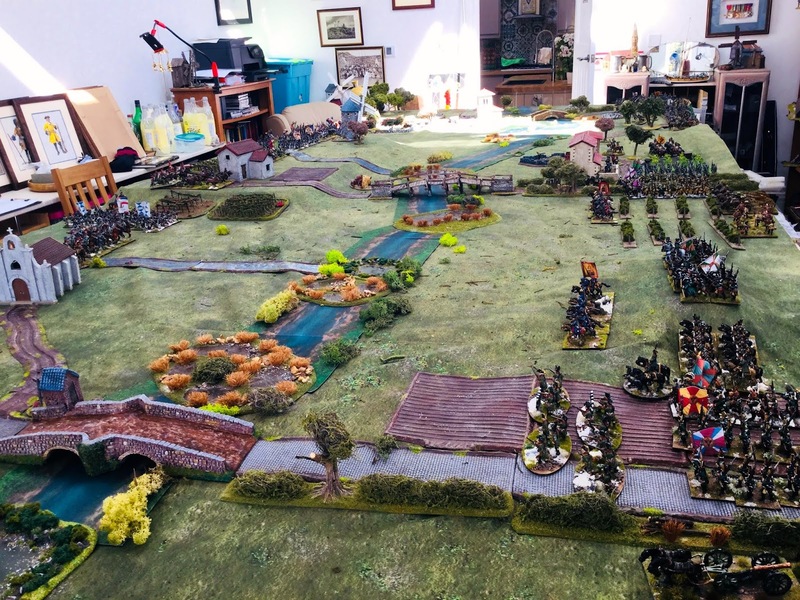 So a great game played in good spirit. 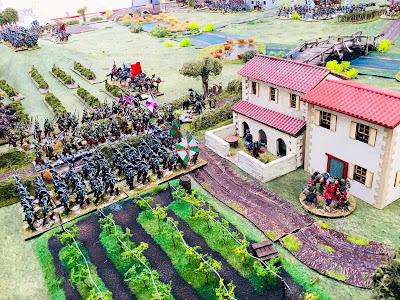 I'm happy with the rule amendments and all I need to do now is work out a scenario for the next engagement in northern Italy, the Battle of Novi. 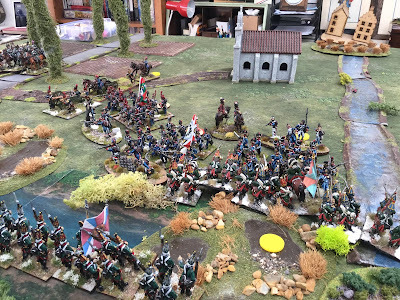 PS while I am happy with the amended BP rules I do want to try out General d'Armee sometime. Anyone local to me who's familiar with them and would be willing to coach me through a game is very welcome to visit. Elephant is on the back table in front of the church. 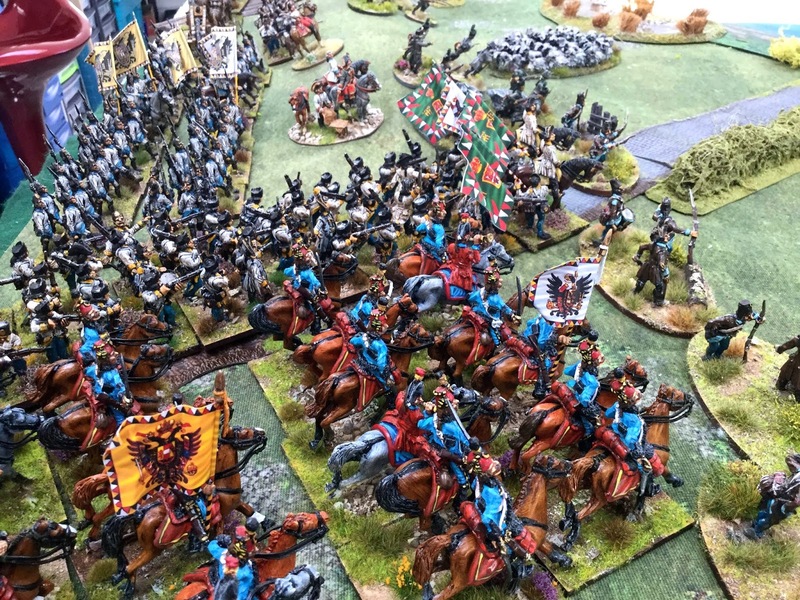 Splendid looking game! Trebbia is on my list of 1799 battles to tackle so I especially appreciate the work you have done on this. Well done for spotting the elephant in the room! Your prize is in the post. 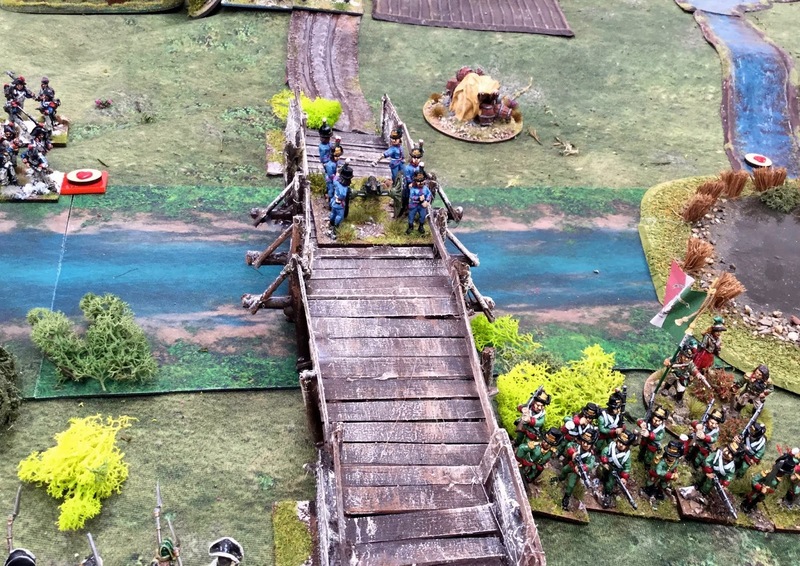 Looks lika a wonderful game, lovely units, terrain...and wooden bridge, love it! wonderful big game with lots of interest. Great looking game! Kudos to Jonathon for spotting the Heffalump. 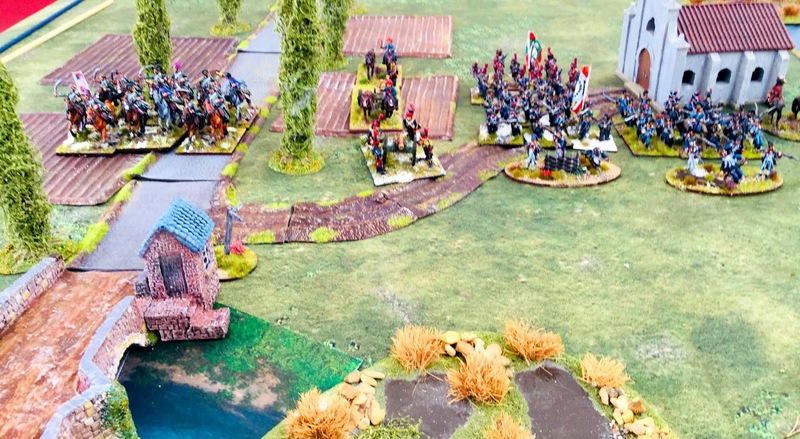 It's great to see this campaign getting some gaming love! What a fine looking game! A grand advert for all that is best in our hobby.